P.O. Joseph Vincent addressing the crowd attending the first 6th Precinct Build The Block meeting for sector Charlie in Greenwich Village. Topics discussed included late night noise by neighbors, Street vendors, Pan handlers, package thefts, drug sales, people riding bicycles on sidewalks, noisy kids on stoops late at night. With its $3.5 million Build The Block advertising campaign, the New York Police Foundation seemed eager to reach out to a younger audience who is skeptical of the police. The ads ran most prominently on Hot 97, and the station says 76 percent of their listenership is in the 18-34 demographic, suggesting the NYPD was hoping to reach someone other than those who attend the long-standing Precinct Council meetings, which tend to draw middle-aged to elderly residents who speak English. But at Build The Block meetings attended by City Limits, skeptics of policing and young people were absent. The meetings, held at public housing developments, senior centers, Police Athletic League facilities and other community spaces, were instead attended by mostly older residents with complaints about parking, marijuana, teenagers loitering, homelessness, and various other quality-of-life complaints, resulting in the type of conversations that already happen in the city’s Community Board meetings or those NYPD Precinct Council meetings. The meetings seem organized to generate such complaints. Each meeting begins with a brief rundown of recent crimes in the neighborhood. Then local officers—called Neighborhood Coordination Officers, or NCO’s—lay out a giant sheet of paper on a stand, take out a thick black marker, and begin asking attendees about neighborhood concerns. At the end of the meeting, officers have scribbled those complaints on the sheet of paper, which they roll up and take back to their precinct. The list consists of specific quality-of-life complaints like multiple cars being parked illegally or the smell of marijuana coming from a public housing apartment. “Build The Block” meetings are the newest element of a wider initiative called “Neighborhood Policing,” a restructured version of the “community policing” strategy of the 1990’s. Then, as now, the NYPD sought to build neighborhood-level contacts in communities to address crime and quality-of-life complaints and improve community relations. But the in-person meetings of this newest initiative appear also to also be meant to build a gentler image for the nation’s largest police department amid increased scrutiny. At many Build The Block meetings, participants urged police to push the kind of quality-of-life enforcement that activists and police skeptics are most interested in pressuring the city to end. At one meeting on March 23 for at the Lindsay Park Co-Op in Williamsburg, a group of older residents complained about homeless residents sleeping on the street. Neighborhood Coordination Officers Joanna Terepka and Tara Tizzio defended the lack of enforcement, saying that they wished trying to treat homeless residents fairly. Terepka was familiar with the resident that neighbors were complaining about. Alex Vitale, a sociologist at Brooklyn College and author of “The End of Policing”, argues meetings like these socialize residents to view the police as their first and best option rather than addressing underlying social problems. “It tends to reinforce the idea that all community problems should be solved by the police department,” he says. Among the groups saying they haven’t benefited from the NYPD’s attempt at reaching across the divide are the city’s street vendors. The city has capped the number of vending licenses since the 1980’s, leading to a large informal sector of illegal vendors numbering over 10,000 by some estimates. Legislation intended to increase permits and fix other outdated restrictions was abruptly killed last December. Eliana Jaramillo, a 69-year-old food vendor who has been selling in NYC for over 30 years, still remembers the first time a police officer confiscated her cart in 2009. As a member of the Street Vendor Project, a group at the nonprofit Urban Justice Center that works with over 2,000 vendors across the city, she’s met with the police hoping to get a more understanding approach, but has not been satisfied. Matthew Shapiro, Jaramillo’s lawyer, says it’s an area of law enforcement where cops have latitude to take different approaches. The NYPD says they only act against vendors because of calls from community members, mostly representatives from Business Improvement Districts and restaurants who fear food vendors will take business from them. And some of these business interests have been making their cases at Build the Block meetings, where they have the ear of police officers. Gordon argued forcefully to NCOs Daniel Iacovides and Rahmaan Wiltshire from the 46th Precinct that more enforcement should be launched against food vendors, and grew frustrated with what she saw as the officers’ lack of response. She suggested that electronics vendors operating illegally were taking money away from P.C. Richards and Best Buy, two stores that the Neighborhood Coordination Officers had to explain were not even in the meeting’s ordained boundaries. Iacovides said he had checked with their legal department and were unable to find any need for enforcement. “I think we were trying to find the actual law that says they can’t do that, that’s the thing we can’t find that. If you could help us with that,” the officer said. Gordon finally suggested that what she wanted was the air of authority that being associated with police officers could bring. She asked the officers if she could walk down Fordham Road with the police by her side. “How about we walk down the street one time together?,” Gordon asked the NCO. “I think that can be arranged,” he replied, while insisting that they would only make sure everyone was in compliance and not take sides. Shapiro, Jaramillo’s lawyer, said that these community meetings are both more likely to attract representatives from business improvement districts than vendors, and that there’s a power imbalance that makes it more likely those businesses will be heard. “They may not even know these meetings are happening,” Shapiro said of the vendors, and often don’t have the free time to attend, since they work long hours and tending to their families. A Business Improvement District, on the other hand, might have a spokesperson whose job it is to attend meetings. Gordon, from the Fordham Road B.I.D., said she had been to several other Build The Blocks for the neighborhood in the past week, as well as Precinct Council meetings, and had complained about vendors at all of them. Save for one event where the officer in charge spoke a few lines of Spanish, none of the Build The Block Meetings attended by City Limits had Spanish language translators, something Shapiro said had been an issue in communication between vendors and NYPD. During his first stint as NYPD commissioner, Bratton implemented a Community Policing strategy in the 1990s under Mayor Giuliani, the driving principle of which was that the NYPD should create stronger partnerships with local community groups while targeting quality-of-life crimes. Most of the elements of the Neighborhood Policing plan are not new but are refurbished versions of older strategies. During his first stint as NYPD commissioner, Bratton implemented a Community Policing strategy in the 1990s under Mayor Giuliani, the driving principle of which was that the NYPD should create stronger partnerships with local community groups while targeting quality-of-life crimes. Bratton returned in 2014 under then newly-elected Mayor de Blasio, reintroducing the idea as Neighborhood Policing. The plan, laid out by then Chief of Department James O’Neil, would address what Bratton felt were failures in previous community policing strategies in New York, according to a Plan of Action he penned in 2015. The plan Bratton laid out divides each precinct into four or five sectors, which should ideally represent the boundaries of existing neighborhoods. Prior to the plan, each precinct had 8 to 10 sectors that were not individually staffed, with a single patrol car sometimes covering several at once. Under the neighborhood plan, each sector has two Neighborhood Coordination Officers assigned to gather information about crime in neighborhoods by developing relationships in the community. In addition, two patrol officers are assigned on rotating shifts with 24/7 coverage of each sector, and two precinct-wide patrols provide additional support. Each of these officers devotes 33 percent of their patrol time to community engagement outside of just answering calls. To that end, the program also relies on what the NYPD calls “community partners,” unpaid volunteers who reside in the sectors and act as liaisons between the police and residents. One such person is Leona Fredericks, 69, an East Harlem resident who serves as a community partner for the 23rd Precinct’s Sector A, which stretches from 96th Street to 110th Street and is bordered by Second Avenue and the East River. Fredericks had a previous relationship with the police, having attended Precinct Council meetings for four years. She’s also undergone Citizens Training, a program the NYPD has had since the 90’s that exposes civilians to the type of training that police receive. Speaking after a March 29th meeting held at the East River Landing apartments, Fredericks said she finds the Build the Block meetings are more interactive than Precinct Council meetings, saying “you’re able to be heard.” But she lamented that even many residents of the apartment complex, for which she serves on the tenant association, weren’t coming to the meetings. The meeting that had just concluded had a smattering of people, fewer than 15, many of whom were older residents living in the apartment complex or in neighboring complexes. Despite the lack of attendance, she counts herself a supporter of the NYPD’s strategy to overcome the pervasive distrust of the police in her area. She’s already seen an impact on people in the neighborhood, she says. Sector officers find attendees for meetings by knocking on doors, handing out flyers in apartment complexes and personally inviting people in the neighborhood. Attendees of a Corona Build The Block Meeting on March 13th, said they had been enticed to come by flyers posted by police in their housing complex. One resident, Patrick O’Toole, a banker living in a neighboring co-op, said he came to the meeting out of curiosity and said he felt better informed afterward. Some sector officers are aware of the lack of young people and have made efforts to bring them in. 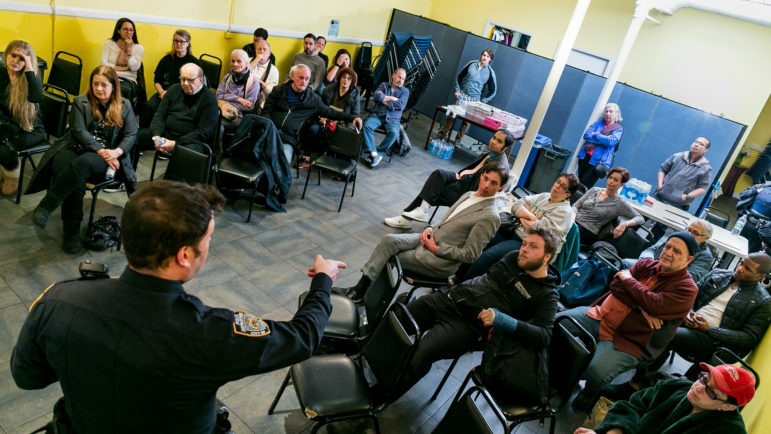 At an April 5 Build The Block meeting in Harlem’s 32nd precinct, PO Peter Diviesti said they had gone to meetings at local schools to hear students’ concerns about policing. He wants those conversations to continue, he says. Like many NCO’s, Diviesti expressed a sense of urgency about building trust with communities. “It’s become more personal, we’re more invested,” he says. “We can go back and make sure the situation was actually taken care of and that people are getting help.” He says he’s mediated discussions between neighbors who complain about each other and has checked in on homeless shelters to see what the next steps would be in getting people help. Reached by City Limits for clarification on which neighborhoods were deemed Neighborhood Policing for the purpose of these statistics, DCPI sent a list of dates and precincts for when the Neighborhood Policing program was rolled out. That list says that the earliest Neighborhood Policing precincts were the 33rd, 34th, 100th, 101st in May of 2015. The statistics from those precincts sent by DCPI, particularly a decrease in arrests, are notable. From 2015 to 2017, shootings remained more or less the same in the 33rd and 34th Precincts, but decreased by more than half in the 100th and 101st. Arrests dropped in all four precincts in the same time period. In the 33rd precinct, arrests dropped by 5 percent, from 4,175 to 3,947. In the 34th, they dropped by 9 percent. In the 100th, by 12 percent, from 2,110 to 1,856. In the 101st, by 13 percent, from 3,180 to 2,750. But a glance at NYPD’s historical data from 2015-2017 shows a more mixed picture, by other metrics. 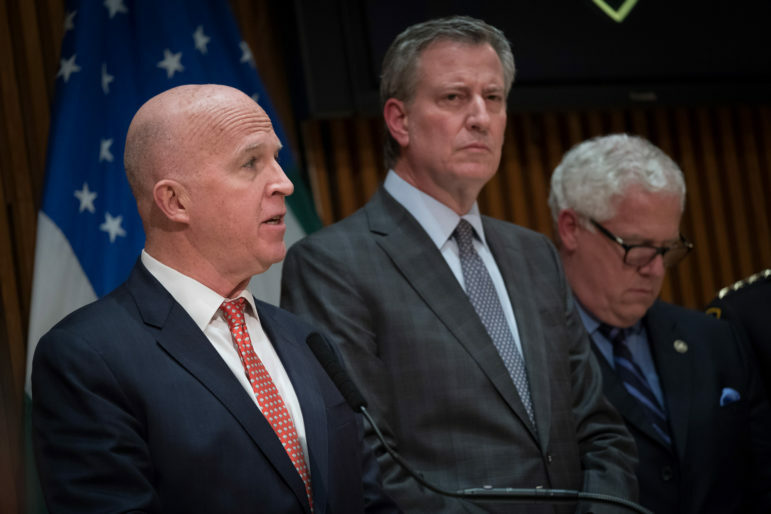 In the 34th Precinct, for instance, robberies declined, but overall, the total of seven major index crimes had increased; grand larcenies had increased in the 34th Precinct by over 22 percent during this period. The 33rd precinct, in Washington Heights, did see an overall decline in the seven categories, despite a slight uptick in murders, from one to two. In the 100th and 101st Precinct, there was a small decline in the total seven index crimes, although burglaries and grand larcenies had increased in the 100th Precinct since Neighborhood Policing was rolled out. But the real change the NYPD seems to want from Neighborhood Policing and Build The Block is an increase in public trust and cooperation from communities hesitant to call the police, something more challenging to measure. If Build The Block meetings offer any evidence, the NYPD has a long way to go before the program can claim to have closed those gaps. 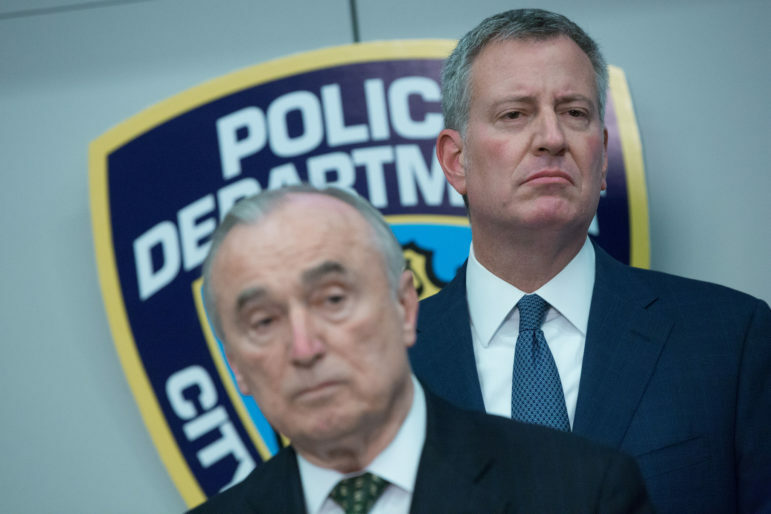 Similar programs have been tried across the country, including Los Angeles, in an initiative also shepherded by Bratton, who was then police chief. That program, the Senior Lead Officer program, provided a blueprint for the NYPD’s NCO program and is still used today. The Build the Block meetings are a key element of Commissioner James O'Neill's Neighborhood Policing initiative. Activists skeptical of Neighborhood Policing point to an increase in the ranks of uniformed officers as part of the problem, not the solution. The NYPD has around 36,000 “sworn officers” today, after the mayor added 1,300 in 2015.
so-called community policing programs miss the mark by asking communities how they would like to be policed, rather than asking if the police are the appropriate tool for certain problems. Imani Henry is an activist with Equality for Flatbush and a social worker vehemently opposed to the city’s Build The Block meetings. He has organized with food vendors, among other groups, bringing them to Precinct Council meetings to talk with the police, but was unimpressed with the outcome. “I have been in private meetings with police and vendors, I’ve watched those meetings go awry. There’s this understanding of ‘We don’t respect you, we’re here to punish you,'” he said. He has been to Build The Block meetings—he said the leading complaint at a meeting he attended in Flatbush was “dog poop”—but wasn’t swayed by the gentler approach, believing it to be an intrusion into the community. He feels the true purpose of the program is to cultivate informants. He thinks the elders in communities who have been attending Build the Block meetings are misguided. Henry points to the killing of Deborah Danner, a 66-year-old woman killed in the Bronx by an NYPD officer, as indication that they too should be fearful of police. Others in the police reform debate have been proponents of in-person mediations and conversations as a method of creating more positive relationships. Norman Siegel, a veteran civil liberties lawyer and former director of the New York Civil Liberties Union, hosted a series of town halls on policing in 2015 with Borough President Eric Adams. At one town hall, O’Neil presented a plan for what would eventually become Neighborhood Policing. Siegel was impressed with the proposal on paper at the time. Siegel believes even imperfect meetings are worth activists’ giving them a try, although he views any potential change as incremental. He calls the Civilian Complaint Review Board, the independent disciplinary body which he helped found 25 years ago, a “huge mess” that has mostly failed at its aims, but says it’s still worth it for activists to attend those and other meetings, to show that they are engaged and not going away. He says the success of community meetings rests on whether they’re just “window-dressing” or whether they dare to touch radioactive issues like racism and classism that the NYPD has been hesitant to address. And if community meetings don’t yield success, other avenues should be pursued. Yet harrowing incidents of the past—the distant and the very recent—fuel the reluctance by some advocates to do anything that legitimizes the NYPD. Henry says his perception is also driven by personal experiences as a social worker for 20 years, watching incidents where police intervened with someone who just needed help. In one incident, he recalls a woman acting erratically after leaving a party at 4 AM. He says police were being hostile, talking down to her and calling her crazy, and were close to arresting her. Henry tried to speak with her calmly and learned the woman had possibly been assaulted at a party. An EMS worker finally intervened and the woman was taken to a hospital. “Why are we supposed to believe they’re going to be loving and kind to us?,” he asked. In the days after police killed Saheed Vassel, a 34-year-old Crown Heights resident with bipolar disorder wielding what police say was a silver soldering rod as if it were a gun, conversations about whether it makes sense to contact police—a topic of discussion after earlier killings of emotionally disturbed persons—again emerged. Henry and other social workers had helped put together a document called “Suggestions And Tactics as an Alternative to Calling 911” after the killing of Dwayne Jeune in the Flatbush Gardens Apartments in June 2017. The document began re-circulating on Facebook in the days after Vassel’s death. “Social service workers, we need to put ourselves out there. We say that everyone get mental health training. We have to advocate for ourselves in our own community, because they’re not listening to people in crisis,” Henry said. Self-reliance is what’s needed, he said, not a call to 911. The sentiment is not unusual for heavily policed communities. Many food vendors share the feeling that attempts at NYPD outreach and community-building are meaningless without decreased enforcement. Vendors say they’re in a limbo created by regulations out of their control and enforced too rigidly; they’re fearful of police and reluctant to turn to them for help. One vendor who spoke to City Limits outside of Corona Plaza in Queens gave her name as Mercy and said she has been vending for 17 years, since she arrived from Ecuador. Mercy said she has received two $1,000 tickets from police since the beginning of this year, and that 2018 has seen the worst enforcement of food vendors she has ever seen in the nearly 20 years she’s been vending. She’s frustrated that only local activists are sticking up for her, not the city. “I wish the city would help us and see that we’re trying to be as clean and lawful as possible,” she said in Spanish. At the March 13th Build The Block meeting for the 110th Precinct, which covers the corner where Mercy vends, the sector’s NCO’s described four recent enforcement operations with the Department of Health in which they ticketed food vendors along Roosevelt Avenue. No Spanish translation was available at the meeting and no food vendors, or any other dissenters, were present. The officers who ticket her don’t speak Spanish, Mercy said, although she believes one of the officers understands her. She’s been to Precinct Council meetings to complain about enforcement with organizers in tow, but said that the ticketing continued. Now she and the other vendors have taken to texting one another when they see an officer, so they’re prepared. “We try to protect each other,” she said in Spanish. NYPD spends a fortune on Faux public relations but truth is too many of us are victims of NYPD crimes. In my case throw in Internal Affairs crime and top brasses complicity — again that is my case and too many others. Zachary Carter sent in lawyers to lie in court for the NYPD IA – the NYPD have no integrity or shame and act like legal mafia. I attend the precinct Community Council meetings, and I’ve been to a number of the NCO meetings, so I feel qualified to offer a comment or two. Yes, there are (relatively) few attendees. And they tend to be older, but they are representative of my community. The issues raised are similar to the issue that come up at our civic association meetings (I’m on the board). The biggest issue is the DOT’s refusal to comply with various aspects of the Vehicle and Traffic Law. There is little that the police can do about that, except not enforce unlawful DOT actions. But let me turn the discussion around. This program, as almost all current policing practices, were developed by Mario Selvagi when he commanded the 101 precinct. He provided NYPD vans to transport people to community activities. He assigned officers to where there were crime hot spots (shades of Compstat – but we couldn’t get the NYPD MIS department to cooperate then). But the NYPD is increasingly bureaucratic. There is little that a precinct commander can do about the behavior of traffic enforcement officers, or school “safety” agents, or even officers assigned to the only subway line in the precinct. I see that as a problem. And it is even a problem that the Borough commander has little control over. So bureaucracy is a serious NYPD problem. And this in a Patrol Borough where the Chief refers to the citizens who live in the area as his constituents. perhaps if the meetings were listed in the newspapers, on the radio, news on tv we all would go I know I will! why not have it on a Saturday around 3 pm so all can join in all over NYC. ill join my pct. How can police heal the divide when they *are* the divide? The reason most of us don’t come us because we dare not enter the lion’s den. Laying down with the lamb doesn’t turn the lion into a llama. These meetings are nothing more than a recruitment fair for informants. Their call for “unity” is a transparent demand for compliance. However, most of us are smart enough to know that no amount of chitchat and coffee with the local armed wing of the state will save us if they decide to set their sights on us. I’ll show up when abolishing the police is on the agenda. I just want to say this. Take it however but when white people made the decision to once make some moves and disrupt more peoples lives like they have been doing for generations by now you would think they would research and adapt or research and decide not to relocate. How do you feel getting the police involved cause what we do is sit on the stoop til 4am. Its a way of life for us. Can someone play the whole tape. Now tell me what happens after the police arrive on a call calling for us to change a way of life.? If you could not handle our lifestyle why move here? Most New York City activists want to mend the NYPD. But the author and others want to end it instead. It always seemed like the veteran lawman co-signed the mayor’s original lease on the NYPD. Now de Blasio is sole possessor. The mayor tabs a civil-rights lawyer to head the Civilian Complaint Review Board. The police unions cry out. The sequence suggests bold change is afoot. The record suggests otherwise, this author says.